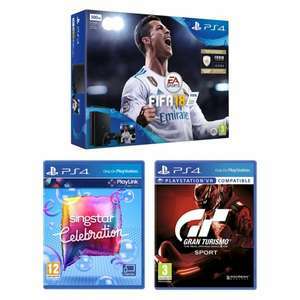 The standard PS4 deals we've been seeing today but use code BLACK to get 20% back as points. If you then share their facebook links you get an extra 2000 points which you can trade for £40 off £200 spend voucher. Can also use Paypal Credit if you need it too! Any deals with both COD WW2 & Star Wars Battlefront 2? THat was what I was looking for Aswell :(. CEX would buy GT and the other game for about £25-30 ish vouchers. That is the closest I could find. So that makes a voucher of £ 40. But we can only use the voucher if we make a minimum of 200 euros of purchase? Or is there no minimum to spend the voucher ? So that makes a voucher of £ 40. But we can only use the voucher if we …So that makes a voucher of £ 40. But we can only use the voucher if we make a minimum of 200 euros of purchase?Or is there no minimum to spend the voucher ? So I can't use the voucher without minimum. I need to purchase £200 to spend my £40 voucher ? Same price at smyths toys or £229 with a extra controller. Deal posting newbie! This is Stefano_Iacono first deal post. Help out by leaving a posting tip or just to show your appreciation for their contribution.